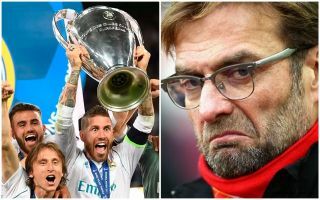 Real Madrid captain Sergio Ramos has aimed a brutal dig at Liverpool manager Jurgen Klopp over his lack of major success in finals. The Reds were beaten 3-1 by Real Madrid in the Champions League final at the end of last season – a game famous for a moment or two of controversy involving Ramos. The Spain international notably collided with Liverpool’s star player Mohamed Salah early on, resulting in him going off injured in the first half and totally changing the shape of the game in Kiev. Ramos was also seen to have been involved in a collision with LFC goalkeeper Loris Karius that night, before he made two dreadful mistakes to gift goals to Karim Benzema and Gareth Bale. Ramos on Klopp not letting the Salah injury stuff lie “It’s not the first final he's lost, [maybe] he wants to use that as an excuse for losing. Some of us have been operating at a very high level for many years, not sure he can say the same." ‘It’s not the first final he’s lost, [maybe] he wants to use that as an excuse for losing. Some of us have been operating at a very high level for many years, not sure he can say the same,’ Ramos is quoted by journalist Dermot Corrigan on Twitter.